Whether you're creating an eye-catching lawn display or wowing the kids with some whopping big options on their Easter egg hunt, really big plastic eggs aren't always easy to find. Fortunately, the Internet has some great options to help you make your celebration extra big this holiday season. If the Easter bunny isn't satisfied with leaving regular-sized eggs around your home, you can pick up larger options that you can fill with toys and candy. Many of these eggs are large enough to fit a stuffed animal or another big gift. Consider some of these options. Measuring seven inches in length and four inches around, the jumbo eggs from Amazon.com are ideal for filling with larger treats or toys. They come in packs of 12 and include Easter-appropriate shades of pink, blue, lavender, and yellow. A flat bottom allows the eggs to stand upright, and a clear plastic top portion means kids can easily see what's inside. These eggs have many positive consumer reviews on Amazon, where they've received praise for their durability, attractiveness, and secure closing. The only major downside of these is that they are sometimes damaged during shipping. A 12-pack retails for about $22. Another option is huge Easter eggs that open horizontally. The adorable jumbo Easter egg containers from Amazon.com are nearly eight inches long, making them just the right size for holding larger surprises. They feature a colored bottom half and a clear top half, and they come in green, purple, pink, and yellow. You receive a random color when you order. Customer reviews on Amazon are very positive, and consumers praise these eggs for their cute looks and durability. The only complaint is that shoppers don't get to select the color. They come in packs of two and retail for about $9. 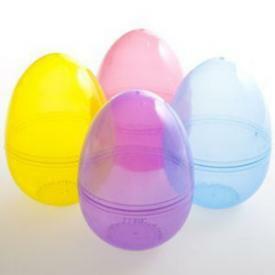 The empty large plastic egg from Fun Carnival is an affordable option. 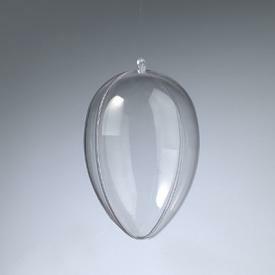 Measuring six inches in length, this two-piece egg has a colored bottom and clear top. 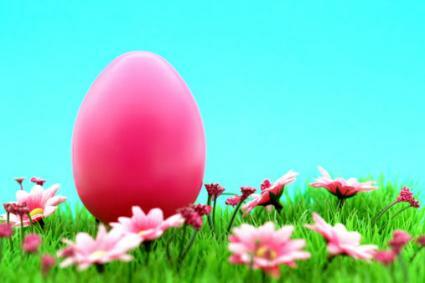 The eggs come in red, pink, yellow, green, blue, and purple, although you can't choose the color you receive. They have a rounded bottom. Although there are no reviews from past purchasers, these eggs make a very affordable choice. They retail for $1.25 apiece, and there are quantity discounts if you purchase more than 144. However, it's important to keep in mind that these eggs are smaller than some other jumbo options and may not be large enough for your needs. When the Easter bunny visits your home, there's no reason he needs to limit himself to hiding eggs on the ground. 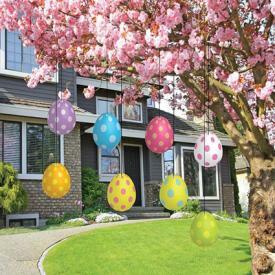 The trees in your yard are also an option with the clear plastic hanging eggs from British retailer Little Crafty Bugs. They measure 140mm (or about 5.5 inches) in length and come in packs of 12. While there are no product reviews of these eggs, they are crafted from sturdy plastic. The retailer says they are high quality and are easy to open and close. You'll need to allow plenty of time when you order these, as shipping from the UK will take at least a week. A set of 12 eggs retails for about 30 British pounds. Decorating your home or yard with huge eggs is a great way to make a major statement this Easter. There are several places that offer exactly the kind of decoration you need. Available in sizes up to 24 inches in length, the giant glitter eggs from Bronner's Commercial Display are designed to be used in shopping malls and stores. However, they look spectacular inside your home as well. 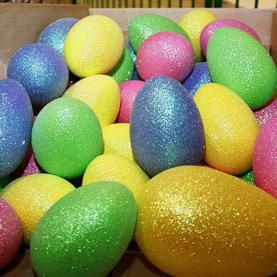 The eggs come in nine different colors and are crafted from plastic Styrofoam and baked-on glitter colors. There are no consumer reviews for these eggs, but it's important to note that you need to order at least six of any color you choose. These eggs are not rated for use outdoors, so it's best to purchase them for an inside display. Fourteen-inch eggs retail for $20 each. If you don't need your egg to be three-dimensional, the adorable flat Easter egg yard decorations from Amazon.com are a great option for holiday style. They measure five inches long and four inches wide, and they come in sets of 32 eggs. The very colorful eggs come in eight different designs, each of which is printed on both sides. They are made of weatherproof plastic and are 1/4 inch thick, perfect for hanging from trees or from the eaves of your home. These eggs have many positive reviews on Amazon, where consumers praise their attractiveness and durability. It's important to note that the eggs do not come drilled for hanging, and you'll need to add your own string. They retail for about $20 for a set of 32. Made using a process in which heated plastic is blown into an egg-shaped mold, blow-molded Easter eggs are a great way to get affordable and lightweight decorations you can use indoors or out. Available from American Sale, these eggs come in two sizes: eight inches and 12 inches. The 12-inch eggs also feature a bunny decoration on one side. Both sizes come in a range of colors, including purple, pink, yellow, and blue. You'll receive a random color when you order. This product gets glowing reviews from past consumers at American Sale, many of whom state that the eggs were colorful and fun. The only complaint was that the cost of shipping the eggs seemed expensive, although shipping rates vary depending on your location. The eggs start at about $3 each. Gigantic eggs can make a major visual impact, and they can really add a festive flair to your Easter party or egg hunt. There are lots of great options out there to make your holiday "egg-stra" special this year.